Well, here we go. I’ve finally got Magnificent Cowlick Media back up as a website. Only took me, ooooooh…forever. 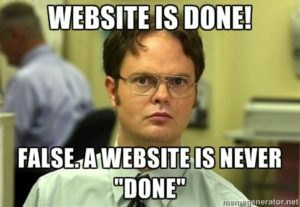 Sadly, I built and awesomesauce website, with MUCH help from my wife/head graphic designer/person with visual taste, in Weebly. I had not realized that GoDaddy no longer used Weebly as one of its building platform thingies, like WordPress and Drupal and whazzitswhatevs. When it came time to import that site- ooooooh noooo, you gotta start makin’ it RAIN, Mr. Man. Show me the money. Etc., etc. Well, I’m a firm believer in thriftiness along with savoir faire, so I adapted much of that awesome site to this awesome site. And now- off to the races!!! Look here for blogs about advertising, about writing, about the business of both, about radio, and occasionally about my cats, Calvin and Sid, who are instrumental in helping. Sooooo much help. Oy vay.